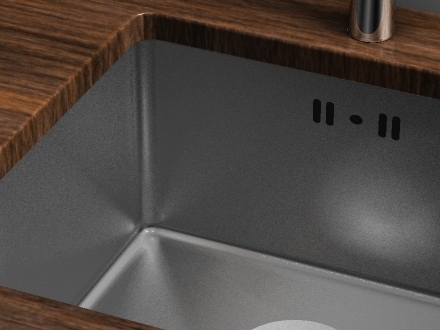 FAQs - Have a question about sinks or taps? If you are thinking of placing an order, or you have ordered and are awaiting delivery and now have a question, you should be able to find the answer here. If I place an order, how long will delivery take? The quick answer is 'as quickly as possible'. However, its not always as simple as that. We have thousands of products available and deal with customers who live in every corner of the country. One thing we can say is we are a specialist company that deal with kitchen and bathroom sinks, taps, waste disposal units and our experience means we deal with the delivery of your goods in the fastest and safest possible way. Each and every product page shows the current stock status of the item. When you have all the products in your basket you will be able to easily see which item has the longest delivery time. If you have a specific delivery requirement we recommend you call and speak to one of our helpful Customer Service Advisors on 01759 307 262. We are flexible and accomodating and always look to meet your exact requirements. Our online system (however good) will have limitations and we always like to rely on a good old fashioned conversation! Can I specify a specific delivery date? Yes, once you are making your way through the checkout process you will be offered a number of options. Included will be a 'pick an exact delivery date' section. This mean you can specify a day within approx 2 months of the order date. A fantastic facility, especially when you want the delivery on your day off or on the exact day the kitchen fitter starts work! Can I have the order delivered to another address? Yes. When you are placing your order you will have the opportunity to specify a different delivery address. This is particularly useful if you want the ceramic sink delivering to the kitchen manufacturer or the undermount kitchen sink delivering to the granite worktop fabricator. Can I get a refund if I need to return a product? Yes. The first thing to remember is you can place your order in advance and then specify an exact day of delivery. So in reality, you can order today and then have the goods delivered in 3 weeks time when the plumber is due to start. From the day the goods are delivered you then have 14 days to decide if the goods are the right ones for you. Obviously if you decide they are not quite right you can arrange to send them back to us ( you cover the cost of return or bring them back to our depot in York). Further information on returns can be found by visiting our Returns Form page. Can I get technical help? Within our Techical department we have one advisor who has almost 30 years experience in sinks and tap so if we cant help you, we dont think anyone can! Your customer reviews are so good. Can I trust them? We only use independant providers of Customer Reviews. We are glad to say that on average we score around 4.75 stars out of 5! When we do let a customer down (which isnt very often) we always look into what went wrong and see if we can put it right and make sure we learn any ways that we can improve in the future. Our main provider is reviews.co.uk and you can visit their website to see an up to date score on our overall performance. If you already ordered from us, or you have already received your delivery and now have a question, you should be able to find the answer here. Dont panic but do act as quickly as possible. We dont recommend sending an email at this point as we cannot guarantee it will be delivered (we cant always control what an email server will class as spam). We suggest you call us directly on 01759 307 262 or try our Live Chat facility online (subject to opening hours). Yes. Depending on exactly how we are planning to deliver your order will determine exactly what tracking information is available. We send all the required details in your confirmation email and more information can be found by visiting our Delivery Information page. As a general rule, yes. However, if one or more of the items are delayed then we can arrange to send out the stock items out straight away. We often do this when the sink is needed for templating by the granite worktop supplier but the kitchen tap can follow. If you would like to arrange a split delivery of your order then simply add some delivery notes whilst placing your order online. A member of our Customer Service team will then call you to confirm the exact details of the proposed delivery once your order in on our system. Do I need to wait in all day for my delivery? No. Depending on the type of product being delivered will determine what service is provided. 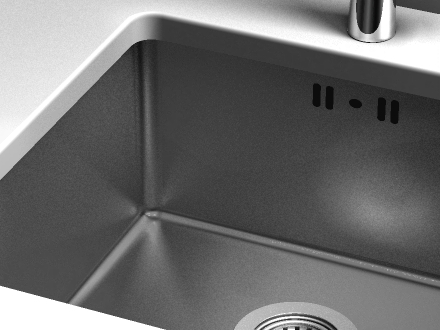 All small/light items such as stainless steel sinks, kitchen taps and waste disposal units that can be delivered by DPD will be sent a text or email giving a 1 hour time slot. You can track the progress online and at anytime if your plans change, you can simply click on a link and give alternative delivery instructions such as, leave with a neighbour, leave in a safe place or come back another day! If your goods are heavy and fragile (Granite or Ceramic kitchen sinks, Bathroom Pottery or Appliances) and need your signature and inspection on delivery then the service is a little different. You must be there to check and sign for the goods. The delivery drivers will be given your contact number and are asked to call you around 1 hour before delivery. On the actual day of delivery, if you need a more accurate delivery window, we recommend you call our customer service team who will contact the local depot to obtain an approx 2-3 hour window. Dont worry we are here to help. It's a simple call straight through to our Customer Service Team on 01759 307 262 or online using Live Chat. We open and carefully inspect all items before they are dispatched to you. Due to that process, the number of orders delivered with missing parts, on average account for only 0.4% of our orders (human error)! That's less than half a percent and that's the way we want to keep it! Can I get a VAT receipt with my purchase? As standard the email order confirmation you receive will include our VAT number as well as the VAT breakdown you require. If at any point you require another copy, or a copy of any other order you have placed in the past, you can simply log into your account and get another. Whats the best way to care for my ceramic kitchen sink? 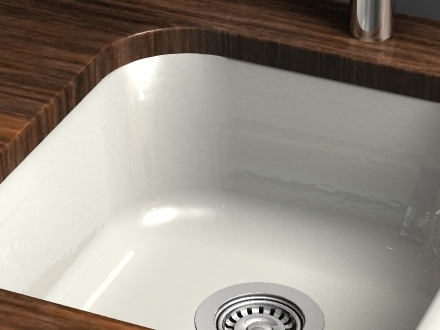 Fireclay sinks are manufatured with a durable glaze that should provide many years of trouble free use. It is not recommended that you use undiluted bleach on kitchen sinks as this can also cause corrosion to any chromed or plated surfaces such as wastes and overflows. Cream cleaners or mild powdered cleaner such Barkeepers Friend are ideal. 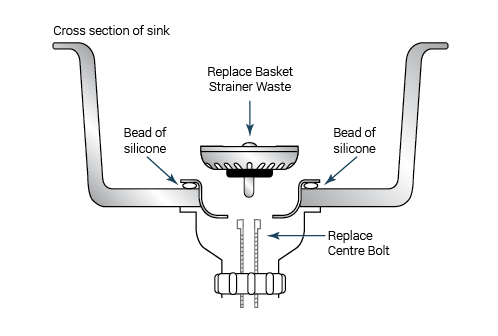 Most modern kitchen taps with a quarter turn ceramic disk will require replacements at some point in its life. You dont need to A) Panic or B) Call a Plumber! 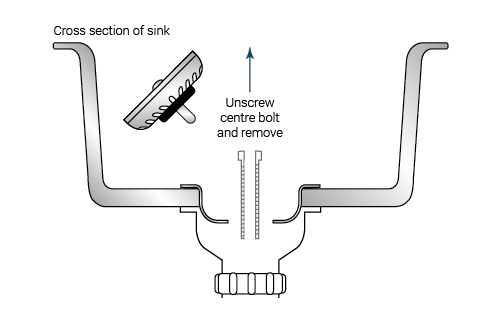 Although the video shown below shows one of the Caple Kitchen taps, the process is pretty much the same for all kitchen taps. 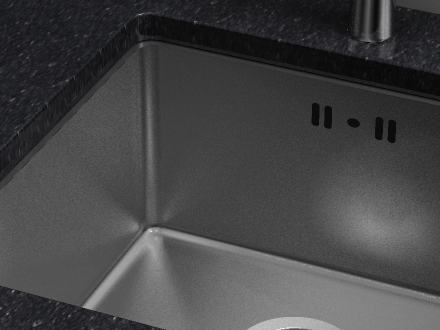 How to fit a flush undermount kitchen sink onto a laminate, granite or solid timber worktop. How to fit an overhung undermount kitchen sink onto a laminate, granite or solid timber worktop. 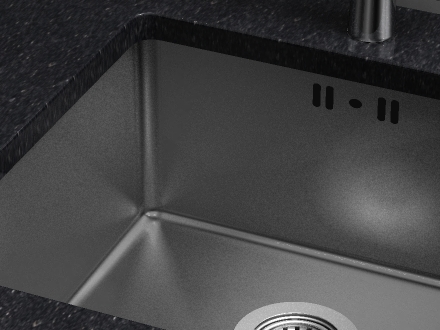 How to fit a recess undermount kitchen sink onto a laminate, granite or solid timber worktop. 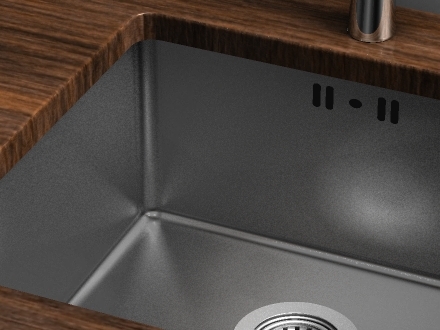 Have you recently installed a new Stainless Steel sink and found rust spots appearing? Dont panic! The material used in the manufacture of stainless steel sinks is metallurgically incapable of rusting or corroding. In other words, its impossible for the sink to rust. It can however, harbour ferrous particles from the newly installed pipework. These particles can easily be disturbed during a new installation. 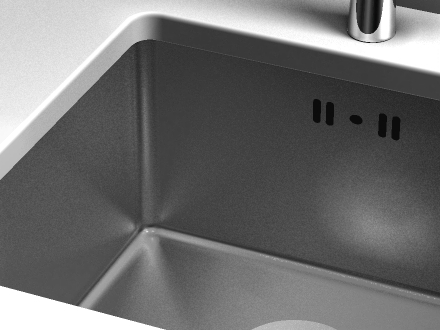 Tiny, microscopic particles cling onto the surface of the sink and then they themsleves start to rust. From first glance, it would seem the sink itself has started to rust. In the first instance you should clean the surface of the sink with a mild powder type cleaner such as BARKEEPERS FRIEND. Using a small damp nylon type scouring pad along with the cleaner should remove most of the particles. The product should be left on the sink for at least 20-30 minutes before rinsing off with clean water. All particles need to be completely removed and it is advisable for the sink to be dried after cleaning with an absorbant kitchen towel. This process may need to be repeated for approx 2 weeks after the installation before the problem disappears. 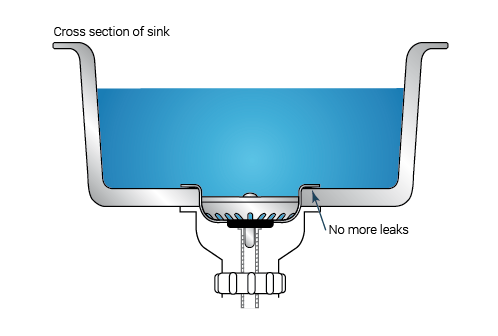 The Problem: You fill your sink up with water and it slowly drains away. There is nothing leaking underneath the sink and, therefore, you think the seal on the back of the plug is not working. You may have even spoken to the plumber or fitter – they have advised you it has been fitted correctly and you need to get some new plugs. The Answer: You firstly need to complete the following test to see if the problem actually lies with a faulty plug seal. We can confidently say that, 99% of the time, the problem is NOT the plug or its seal. Here we explain the basics of what we are dealing with. 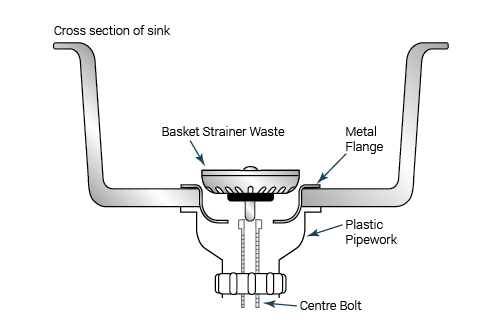 The plug (also known as the basket strainer waste) is sat into a metal flange. When you push the plug downwards, the seal on the underside of the plug comes into contact with the flange and creates a seal. Push the sink plug down as you would normally to seal and then fill to just over the top of the plug with water. Be careful NOT to put too much water in. 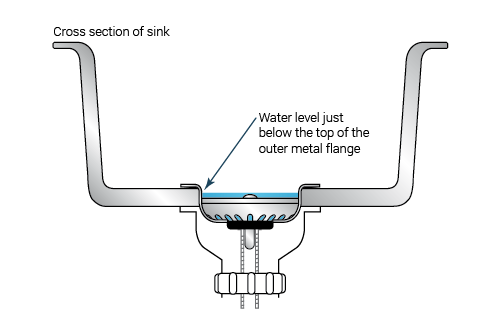 You do not want water to go over the top of the metal outer flange and into the sink. If the rubber seal on the plug is faulty, the water will now drain away and you will need to order a new plug . If the seal is not faulty the water will remain and, therefore, prove that there is nothing wrong with the plug. We will now explain exactly what the problem is. 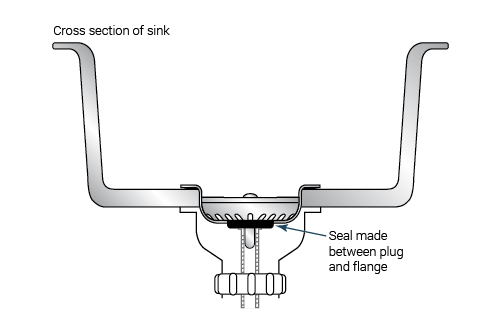 Basically, if water is draining away, but not through the plug seal, the sink has not been fitted correctly. The water is actually leaking underneath the metal flange due to a missing waterproof seal. 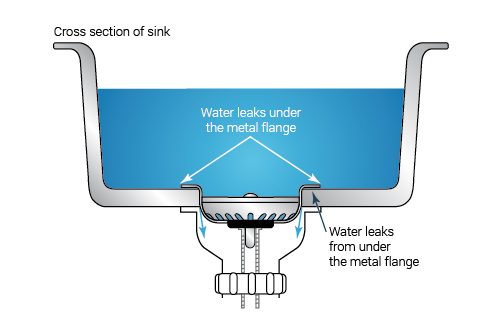 In many cases, the installer has either dry fitted the metal flange providing no watertight seal between the metal flange and the ceramic sink. Or it is possible that the installer has used a fabric or rubber seal that is not adequate. In most cases, this will suit all types of waste system. Start by removing the basket strainer waste plug and put to one side. Unscrew the centre bolt and place to one side. You should now be able to pull off/lift up the metal flange. On inspection, you will either see no silicone sealant on the underneath, a broken ring of sealant or nothing at all. All you now need to do is ensure everything is dry and clean. Apply a small bead of silicone sealant to the underside of the metal flange. Carefully place the metal flange back in place and refix the centre bolt back into place. Leave the sealant to completely dry (please refer to the manufacturer’s recommendations). Once dry you can put the plug back into position. Fill the sink up with water and you should find it no longer drains away. The Problem: You need to find out if you have a low pressure system, because either the kitchen tap you have doesn’t deliver enough hot water or you are considering replacing your existing kitchen tap and you have seen lots of information about high pressure, minimum pressure and don’t fully understand what you need! The first thing to do is to figure out if you have a traditional gravity fed system? In the first section, we explain just what to look for. A gravity fed system will start with a cold water feeder tank, normally located in the loft space. If you are in an apartment or don’t have a loft space, this tank can be located directly above your hot water tank. When and if you discover the cold feeder tank is in the loft, it’s worth noting at this point how high up it is in the loft. Many tanks are positioned on a wooden frame or platform to get them as high as possible. Whilst in the loft, take a measurement from the base of the loft floor to the bottom of the cold feeder tank – you will need this measurement later, when you come to work out your pressure. The next task is to confirm you have a hot water cylinder, normally located in your airing cupboard, and traditionally surrounded by spare bedding and towels! It is important to ensure that, when you inspect the hot water tank, there has not been a pressure vessel added above the tank. If there is a small round tank sat above the main water tank, you may have a different system – a pressurised cylinder. We will cover this type of system in a later post, but a low pressure tap is not required in this instance. So you have confirmed the location of the cold feeder tank and the hot water tank. The next job is to work out just what pressure your hot water is generating to your kitchen tap. The next diagram explains just how to do this. Total distance 4.6 metres = 0.46 Bar pressure. However, that is not the end of it. In theory, the length of the pipe from the hot tank to the kitchen tap and any sharp bends in the pipe can reduce the final pressure experienced at the kitchen tap. There is no single answer that covers every possible scenario. Our advice is to take 10% off your calculated Bar pressure – therefore 0.46 Bar becomes 0.41 Bar – we’ll call it 0.4 Bar!! The next step is to look for a kitchen tap that states a minimum pressure of 0.4 Bar or less. It’s important to note that the lower the pressure rating shown on a tap means you should experience a better flow of hot water. For example: You have calculated that your hot water pressure is 0.4 Bar. In this case, a tap which shows a minimum of 0.2 Bar will work even better than a tap which states a minimum of 0.3 Bar or 0.4 Bar. We have a specific category on our website which shows a large number of low pressure kitchen taps. In a separate help guide, we will be covering the options available when trying to install a high pressure tap, such as a pull out spray tap or water filter tap, when you have a low pressure or gravity fed hot water system.